a film about a clown who must make his audience laugh at the cost of his own sorrows. Dharmendra, Dara Singh, Padmani, Rajendra Kumar. The film is considered to be one of the lengthiest films of Indian cinema. 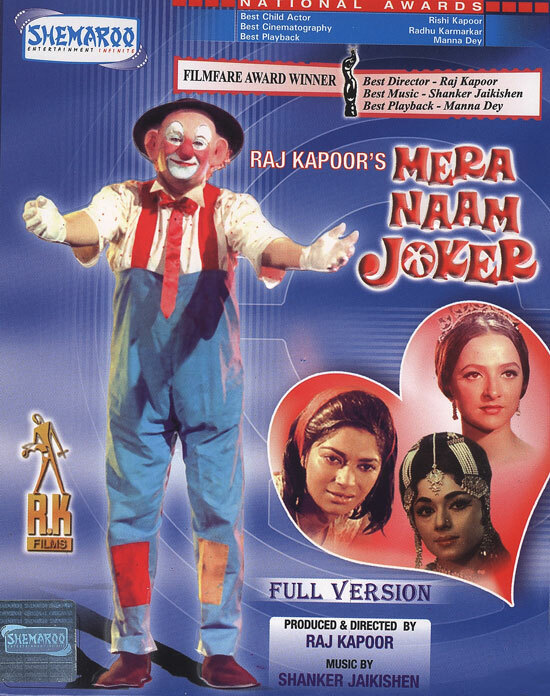 Mera Naam Joker was highly anticipated as it was six years in the making and was heavily publicized to be loosely based on Raj Kapoor's own life. Upon release the film turned out to be a critical and commercial disaster putting Kapoor into a financial crisis.The Movie Was big Flop At the Time Of Release. However, over the years, the film has gained a cult status and is regarded as a classic today. Both audience's and critics' response has turned highly favorable with the passage of time. Movie Was Re- Release on 1980 with the extended cut and movie length Short by its original length and Become Successful hit. Movie won Several Awards including Filmfare award for Best Director, Best Music Director,Best cinematography,best male playback singer for the song " Ae Bhai Jara Dekh Ke Chlo". Rishi Kapoor Was Child Actor in the movie and playing childhood role of raj kapoor. The Film Remembered for the music score. 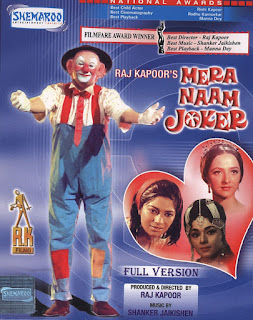 film had many hit and melodious song like "Jeena yaha marna yaha","Jane kha gaye wo din","Ae bhai jara dekh ke chlo","Kahta he joker sara zamana".